The most common complaint associated with mole problems is their tunneling habit. They cause mole damage when they tunnel beneath the earth and build extensive tunnel networks. Mole tunnels that are close to the earth’s surface are typically feeding tunnels, identifiable by the resulting areas of raised ground. Unfortunately, moles have the ability to dig one foot of shallow tunnel per minute. Tunnels that are deeper below the surface (between 6 and 24 inches deep) are typically shelter tunnels where moles will enter during severe weather conditions. 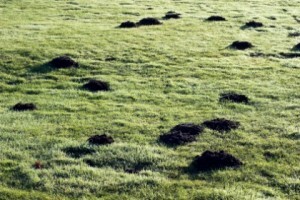 Moles in yard will dig deeper tunnels at a rate of 12 to 15 feet per hour. Moles are from a different family from that of the rodent. Moles can range anywhere from 5 to 8 inches in length. They can either have brown or gray fur with pink feet, noses and tails. 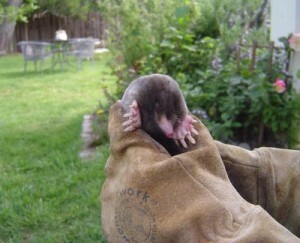 You usually can’t see mole eyes, as their light-sensitive eyes are covered by fur. Moles have broad front feet with special claws for digging tunnels and fleshy noses that they use for the sense of touch.